That’s a brash tagline to include on your cover, but kind of a clever one to go with, all things considered. The Houston Rockets had just won back-to-back championships the season prior, NBA Live 95 had been a great starting point for the series after leaving the NBA Playoffs lineage behind, and NBA Live 96 brought some great new features to the table. Still, it’s a bold claim to make, and not everyone at the time agreed with it. Even though NBA Live 96 is one of my all-time favourite basketball games, I can certainly see where they were coming from. It’s not that NBA Live 96 is a terrible game – I do feel that it holds up just as well as NBA Live 95, when it comes down to it – but it wasn’t the huge jump over NBA Live 95 that NBA Live 95 was over NBA Showdown. The bar was probably set too high, and the technology at the time simply wasn’t able to accommodate the next big jump in graphics and gameplay. 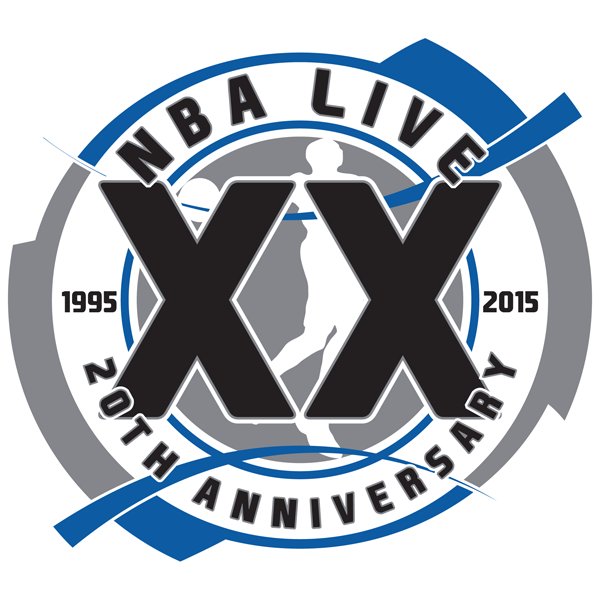 That means that NBA Live 96 is a very similar game to NBA Live 95. On the bright side, NBA Live 96 is a very similar game to NBA Live 95: a game that’s considered a classic, and as I mentioned in my retrospective, holds up surprisingly well 20 years later. Whether it’s the PC or Super Nintendo version you’re talking about, the gameplay is more or less the same as the previous year. The PC version still didn’t have a steal button despite a whole keyboard and various multi-button PC gamepads to choose from, but it was visually superior to both its predecessor and console equivalent. 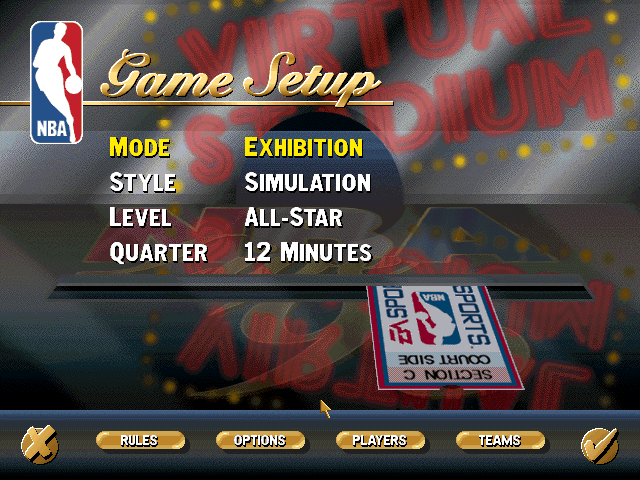 NBA Live 96 PC did add on-the-fly playcalling however, allowing users to run four different plays using the function keys. You could assign the play of your choice to each of the four keys, and see how they were supposed to be run thanks to an animated play diagram in the coaching options screen. Needless to say, playcalling logic was primitive compared to what we see now, but it was functional, and a step up over setting one offensive play and one defensive play in NBA Live 95. The PC version also boasted multiple camera angles in both gameplay and instant replay, something we take for granted now, but a first for the series and a rarity in basketball video games at the time. Team rosters were expanded to fourteen players, allowing for two inactive roster spots. A Free Agent pool was added. 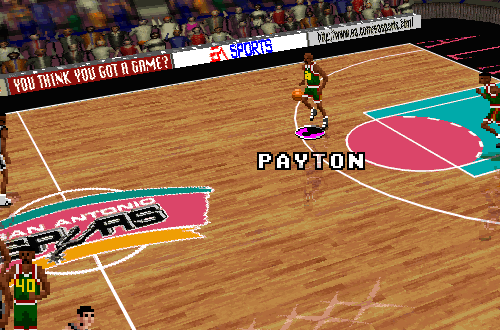 Create-a-Player also made its debut, while the four custom teams from NBA Live 95 – the Slammers, Jammers, Blockers, and Stealers – were retained. Team art was updated for the 1996 season, and as the back cover made sure to point out, the game included the expansion Vancouver Grizzlies and Toronto Raptors. The PC version of NBA Live 96 came out a little later than the Super Nintendo version, so the rosters were more up to date, included the class of 1995 rookies, and accounted for the results of the 1995 Expansion Draft. For those who are unaware, there was actually a brief lockout during the 1995 offseason, which delayed player signings from being made official. This in turn affected the accuracy of the rosters in NBA Live 96 on the SNES. 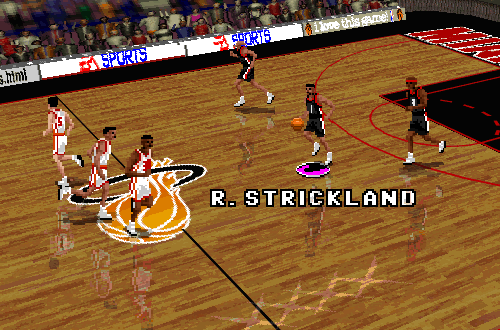 While the SNES version of NBA Live 95 had included 1994 season rosters, the PC release had established the trend of featuring lineups from the current (or upcoming) season. 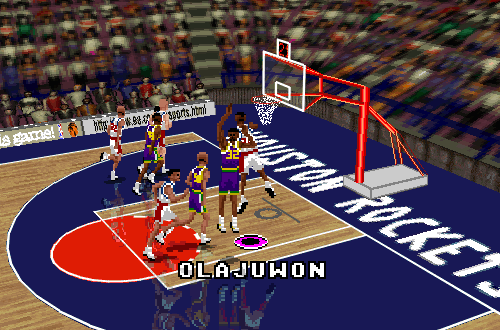 As such, the Super Nintendo version of NBA Live 96 had a couple of unique features. 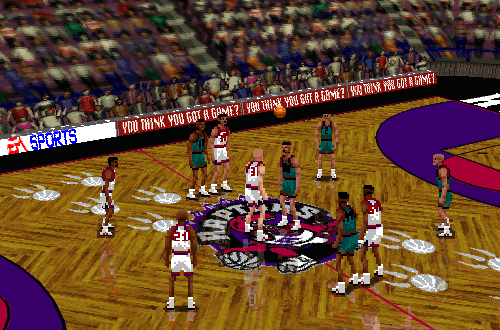 Upon firing up the game for the first time – or, after resetting the rosters to default – users were able to hold the 1995 Expansion Draft for the Grizzlies and Raptors. From there, you could pick for one of the teams, pick for both of them, or simulate the whole Expansion Draft. If accuracy is what you were after, you’d need to have the results of the Expansion Draft on hand and manually make all the picks, as the simulation was somewhat random. There was no Create-a-Player on SNES, at least not with empty roster slots as in the PC version. Instead, there was an assortment of Roster Players that could be edited and overwritten with the players you wanted to add to the game. 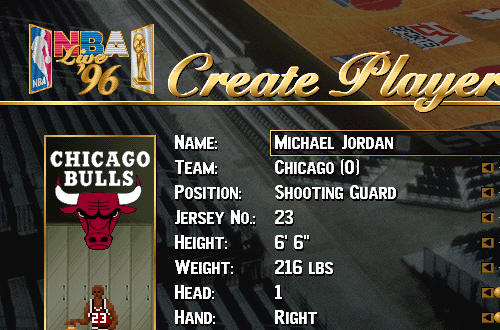 This is how you could add missing players like Michael Jordan, Charles Barkley, and the class of 1995 rookies. In fact, EA made it very easy: just enter their surname, and they’d automatically be generated. They also threw in the ability to automatically create a few Legends in this manner, including Larry Bird, Magic Johnson, and the long-retired Wilt Chamberlain. Unfortunately, the NBA wasn’t too pleased with those particular Easter Eggs, so it was the first and last time we were able to do that. For the record, the PlayStation version was somewhere in between, with updated rosters (including a couple of players that weren’t in the PC version) and the rookies, but no Create or Edit Player functionality. Instead, there were just Roster Players in the place of Michael Jordan and Charles Barkley, with no means of changing their bio data. As for the visuals and gameplay, it resembled the PC version, but did have a steal button, the same as the SNES release. Taking into account all of these new features – expanded playcalling, deeper roster management, multiple camera angles, enhanced presentation – it’s still fair to call NBA Live 96 a step up over NBA Live 95. Compared to the year-to-year changes of the NBA Playoffs series, NBA Live 96 showed some very welcome improvements over its predecessor. As I said though, aside from slightly improved graphics, and possibly an animation or two, it was basically the same game, with 1996 season rosters. Again, this did mean we were getting a very good basketball game (for the time), but it also meant a few issues from NBA Live 95 carried over. For example, player momentum was still a little out of control, so it was possible to take running three-pointers where a player would end up landing a long way inside the arc. Similarly, it was a little too easy to fly out of bounds when grabbing rebounds. Blocks were still a bit too plentiful, especially on dunk attempts. 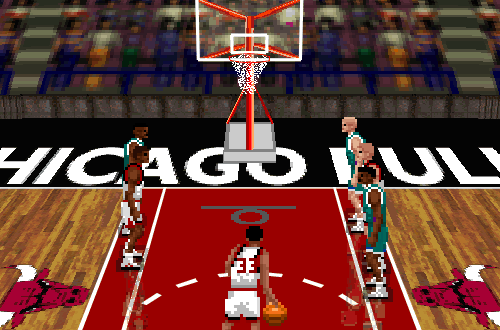 Strategic and realistic play was possible to an extent, but the AI was pretty much the same as NBA Live 95. So, once again, video game strategies were the way to go if you wanted to win on a regular basis. While these issues are very apparent in hindsight, I have to admit that at the time, they didn’t spoil the game for me too much. I would still say that NBA Live 96 was the best sim-oriented basketball game out at the time (though Total NBA ’96 isn’t without its charm), and I spent a lot of time playing it. It’s also the game that got me into roster editing: originally, doing what I could in-game and referring to NBA magazines and episodes of NBA Action for the latest transactions, then when my family got connected to the Internet, looking up information on NBA.com and making full use of the roster editors created by Tim, Lutz, and Brien. Thanks to their hard work, NBA Live 96 was a much easier game to edit than NBA Live 95. I’ve touched on it earlier, but it should be noted that NBA Live 96 on PC had much better presentation than NBA Live 95. In addition to the crisper visuals during gameplay, the menus just looked more slick and polished. The layout was essentially the same, but the artwork was more vibrant, the animated ticket popping out of the slot on the main menu looked cool, and the gold buttons and details just made everything look…classier. NBA Live 96 also had a great jazzy soundtrack that I’ve always really liked. Whenever I fire up the game and I’m greeted by those menus, and I hear that music, I’m always hit by a wave of nostalgia. Of course, firing up NBA Live 96 PC back in the day wasn’t always so easy. In fact, in some ways it’s probably easier to get it all set up through DOSBox and play it now. That’s because NBA Live 96 was on the cusp of needing a Pentium to run properly on high settings, and our family was still getting by with a 486 DX2/66, with a whopping 8 MB of RAM. Yes, in the past 20 years or so, we’ve gone from new PCs with 8 MB of RAM to new rigs with 8 GB of RAM. In any event, to run NBA Live 96 properly, I had to make a boot disk that launched into a DOS environment, which was configured to have enough extended memory to run it. It was the same story for the original Need for Speed, and a couple of the other more demanding games that I owned. Fortunately that stopped being an issue after we added some more RAM and upgraded to Windows 95, but you know what? Going through all that trouble just to play one of my favourite games made it even more special, and in an odd way, I kind of feel nostalgic about that, too. That said, I don’t miss having to go to those lengths just to get games to run! 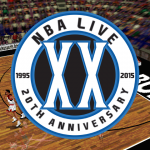 I kept playing and patching NBA Live 96 for several years after it came out. Although the games that followed it certainly made improvements, it was a title that I could just keep going back to, mostly for single player seasons. For whatever reason, my cousin and I would play NBA Live 95 and later games co-operatively, but NBA Live 96 was mainly just my game. From memory, the last time I regularly played it, I had just started a season with my 1998/1999 roster patch. That didn’t last too long though…the Bulls weren’t all that fun to play with immediately following the breakup of the last championship team. How would I sum up NBA Live 96? Honestly, I feel it’s a little underrated. It wasn’t the first game in the series, so it doesn’t stick out in a lot of gamers’ memories the same way NBA Live 95 does. It didn’t add a new mode of play, nor did it see a huge improvement in gameplay, so it’s not remembered as a milestone game in the series. In some ways, it was an updated version of NBA Live 95, which didn’t make it bad, but also didn’t satisfy everyone’s expectations at the time. And yet, NBA Live 96 was more than that, too. It introduced important customisation and roster management features that we’d come to take for granted in future releases. It ramped up the presentation with multiple camera angles and improved visuals. It added a few new wrinkles to the gameplay in terms of playcalling. And it delivered a gameplay experience that was at least as good as its predecessor, which is to say, extremely good by the standards of the era. NBA Live 95 is often looked upon as a classic, and rightfully so, but you know what? I’d put NBA Live 96 right up there with it.